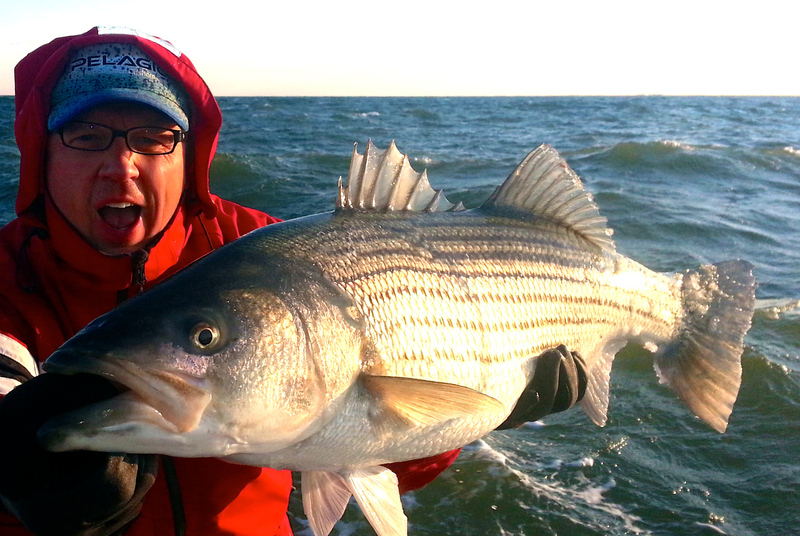 I bet you’re aware that the rockfish catch and kill season opens this Saturday in Maryland. While I enjoy seeing people get excited about fishing, I always dread the start of the kill season. Opening Day doesn’t mean much to fishermen who are in it for the simple joy of fishing. Most of us have been catching and releasing fish all winter. We fish because we love the sport, not because it puts meat on the table. I like to eat fish too, but you won’t see me keeping any big stripers this trophy season. Scientists and regulators have finally recognized what fishermen have been saying for almost a decade: Stripers are in trouble. The striped bass spawning stock has been in decline since 2004 and fewer fish are caught every year. Changes are on the horizon, but until they can take effect, it’s up to us to be careful and preserve this resource. Big rockfish don’t taste good and they aren’t good for you. Check out this video produced by Jeff Little of Confidence Baits. Jeff caught and released his personal best rockfish on my boat Thunder Road this winter. We got some great footage of fighting and landing big fish that day. Near the end of the segment there is some good information about why it’s critical to your health and the health of the fishery to release the largest fish. Most of the boats you see on the water during the spring trophy season will be trolling. As unbelievable as it sounds to those not familiar with Maryland fishing, it’s not unusual to see a single boat pulling more than two-dozen lures this time of year on the Chesapeake Bay. The way I see it, if you really think you need twenty-four rods to catch your one-fish-per-person limit, you probably do. Frankly, I’m not too worried about those guys catching too many fish. Do whatever you have to do, but I know a lot of good anglers who do just fine with one rod. The spring-time challenge for the one-man-one-rod angler is finding fish that are concentrated enough to make casting fun. Since the Chesapeake Bay has nearly 12,000 miles of shoreline, that can seem daunting. It isn’t really if you think patterns, not places. 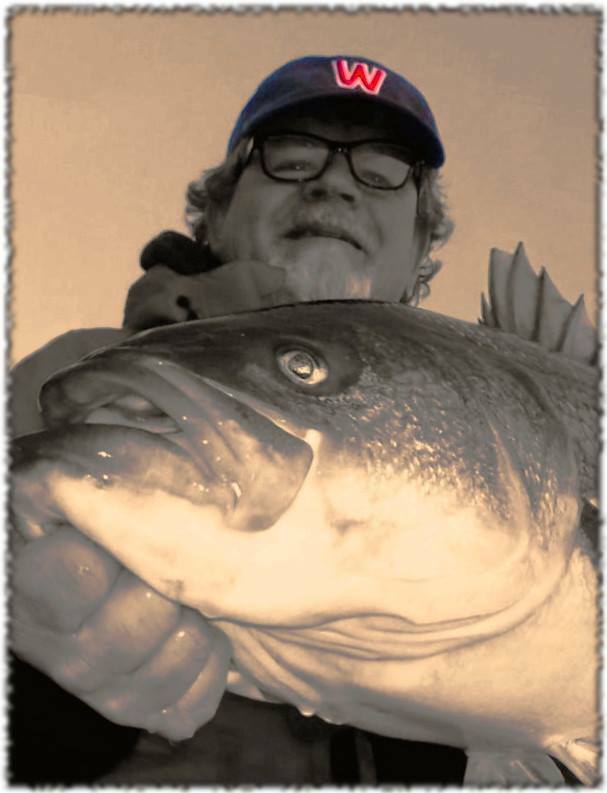 Many anglers head up to the Susquehanna Flats in April. While some nice fish are being caught on the Flats this year, it’s only a shadow of what it has been in the past. I like fishing the Flats too, but fortunately, it’s not the only place we can go right now to catch big fish by casting artificial lures. The reason the Susquehanna Flats hold fish in April is because it’s a broad expanse of relatively shallow water that is easily warmed by the sun and very close to striped bass spawning grounds. Transpose that to other areas in the Bay and think about the pattern. Are there other shallow flats in the Chesapeake Bay that are near spawning rivers and warmed by the sun? Of course there are, and there are fish at those spots right now too. There are flats near where every river enters the Bay. You may have heard that bait fishermen are catching some very nice fish using blood worms off the western shore points. Bait fishing isn’t my cup of tea, but there’s no doubt it is effective. These same areas can also be fished productively using artificial lures by an angler who is patient and knows what he’s doing. Fish are feeding shallow on both sides of the Bay. Many of the Eastern Shore rivers are closed by regulation to striper fishing right now, but Eastern Bay is open to catch-and-release fishing. If you’ve read my reports, you know that the essential elements of a good shallow-water fishing spot include current, cover, presence of bait, and an escape route to deeper water. In the spring, you also should factor warmer water into that equation. Find a place where those essentials occur near a shallow warm flat, and I promise you will find rockfish. Since current and cover are the easiest elements in the equation to recognize, start there. The water doesn’t have to be too deep. 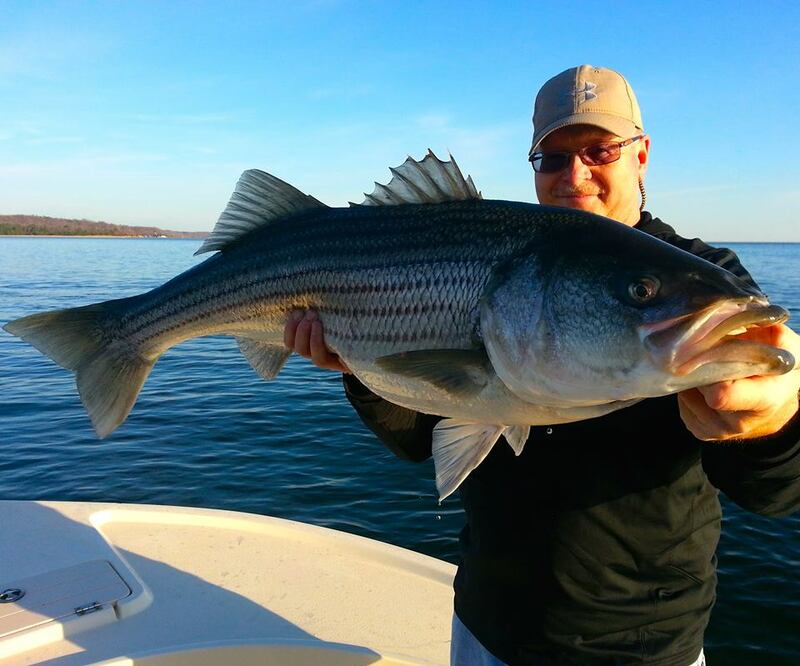 Three feet is enough to hold big stripers as long as there is deep water nearby. Look for rocks, ledges, ditches, and pilings in areas where the current sweeps through quickly. Shoreline is great, but underwater humps and ledges in open water can also be good. 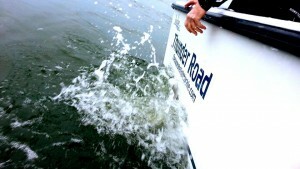 Factor in the tides and consider how they may affect water temperatures. Don’t disregard the areas near boat ramps, docks, or bridges. Many fishermen cruise right by the very best fishing locations because they’re so close to where they put their boats in. Areas near to the mouths of rivers can be especially good because the water coming out of the shallows is generally warmer. Outgoing tides can result in excellent fishing around river mouths. A high and falling tide in April near the downstream side of a river mouth is a surefire recipe for successful fishing. Although it’s harder, you can also catch fish in these areas on an incoming tide. That’s a good time to look at deeper spots where fish might be staging. I’ve been getting good reports from both sides of the Bay from fishermen who are working these very patterns. Right now, I’m finding fish holding very close to the bottom in water between 3- and 17-feet deep. These are the same spots I work in the fall with topwater lures, except in April I cast sub-surface lures. A one-half or three-quarter-ounce six-inch soft plastic jig worked along the bottom near a rocky point will catch fish. So will a RattleTrap, a stickbait, or some other swimming lure, preferably something that doesn’t hang up too often. Bucktails and spoons will also work in shallow water/high current situations, but I prefer a lure that makes a lot of noise. If boat fishing isn’t in the picture, you can just as easily catch fish from the shore. Don’t ignore that rocky point you drive by every day on your way to work. There are probably fish there right now. In another few weeks the water should be warm enough to cast surface lures. I usually get a few topwater fish in April, but the action will really heat up once water temperatures are consistently above 60 degrees. Start with spooks on calm days but move up to a chugger when it’s windy or when fish are feeding aggressively. The bigger the lure, the better. I like Lonely Angler Holos, Heddon Super Spooks, and Stillwater SmackIts. Follow the same pattern as above for locating a good fishing spot, and try to keep your lure in the strike zone as long as possible. By strike zone, I mean the area where fish are most likely to bite. 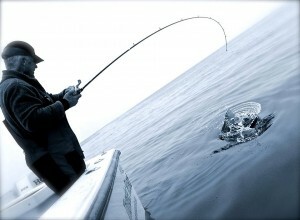 The best way to fish a point or rip with a topwater plug is to position yourself downstream and cast into the current. You want your lure moving at roughly the same speed as the current and across the rip as long as possible. Strikes are most likely to occur right where you see the ripples change along the rip. Most of my fishing lately has been on weekends around Kent Island. We enjoyed a good yellow perch run in the Eastern Shore rivers this spring. The white perch run was short-lived, but very intense. 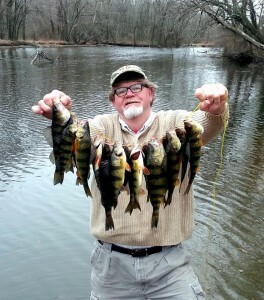 It’s encouraging to find good perch fishing close to home this year. Since I work in D.C., I’ve managed a few late-evening trips to Fletcher’s Boat House on the Potomac River to fish for hickory and white shad. Shad fishing is a lot of fun, and it also provides some good lessons for striper fishing. Unlike most fish, shad don’t attack lures out of hunger. Instead, all shad strikes are reaction strikes brought on by instinct. Employ all the strike triggers you know. Sometimes, just the slightest change in lure style, color, weight, or retrieve will trigger more strikes and make all the difference in how many shad you catch. A good way to to learn how to catch more rockfish is to spend some time studying the strike triggers of hickory shad. Shad fishing has also been good on the Susquehanna River near Deer Creek, in some of the lower tributaries of the Potomac, and at the Conowingo Dam. Some of the Eastern Shore creeks and rivers have also produced exceptional shad runs this spring. Here’s a video clip of our shad fishing trip to Fletcher’s Cove on the Potomac River last Sunday. 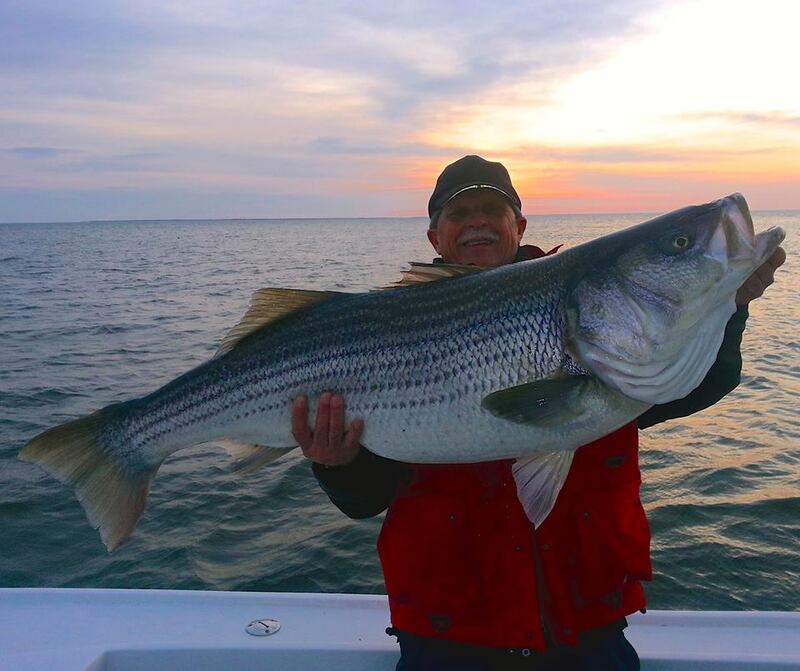 In case you haven’t heard yet, Rich Jenkins released the biggest rockfish I’ve ever seen in the Chesapeake Bay a few weeks ago. Well over 50-inches long, he caught it on a 10-inch avocado-colored BKD that was hotrodded with red garlic dye using 10-pound-test braid and a 20-pound-test fluorocarbon leader. Even with that light line, he landed that fish in well under 10 minutes and it never even got close to spooling him. I’d congratulate Coach Jenkins on the fish of a lifetime, but it won’t surprise me one bit if he tops it on his next fishing trip! Good luck fishing and remember: a picture saves a thousand fish. Great read with very useful tips. I enjoyed the shad trip. It makes me want to go fishing. Just finished going thru your archives for remembering spring time patterns! Thanks for the timely update. Excellent read with some good tips! Thanks! Thank you for the article and your time you take to write it. 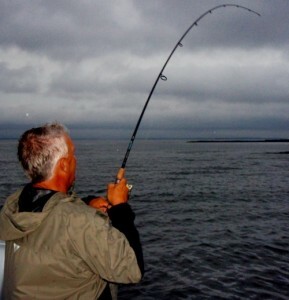 Good read Shawn… Sometimes everything matters…we had been marking lots of neutral feeding mode fish and able to catch one here and there… but when the last 2 weather fronts came thru it sparked a good bite. Thanks for the info over the years, it helped us to find those fish and eventually catch them. I like all the great information you provide us Shawn, Thanks! And I forgot to mention, That fish Rich caught looks bigger every time I see that picture. What a AwWESOME Fish! What an excellent fishing report to learn from. Thank for sharing your knowledge.